Tartan fabrics in wool, silk, and man made fibres. Traditional 'Woven in Scotland' kilting cloth (plaid) in Mediumweight and Heavyweight Pure New Wool. Traditional formal accessory for the smart dresser in wool, silk, and man made fibres. 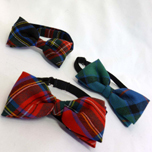 Great evening wear accessory in wool, dupion silk and faux dupion in any tartan. Essential tartan accessories in silk wool and leather. Tartan braces (suspenders). 67 items in 11 Categories 1 unassigned.